"Thanks Doug, I really do appreciate all of your hard work. I will keep you at the top of my list for entertainment needs. Thank you so much." "Thanks for coming up Doug. I really like your work. I will be in touch regarding other opportunities in the future." Brian Chandler, Entertainment Manager, Harrah's and Harveys Lake Tahoe. I love what you do. Plus you are an easy fellow to work with. That scores big points for the tech crew. Once again, thanks for doing your thing with us in Sapphire. I hope we can work together again in the future. Need live music? 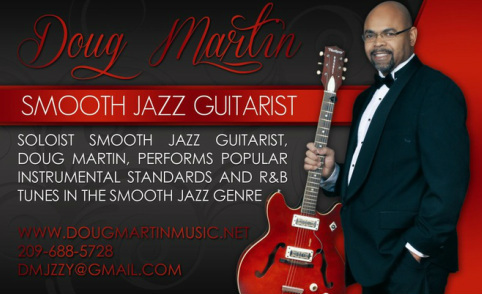 Add the ambiance of live smooth jazz guitar for your next event. Doug's solo performances are self contained with background tracks. Send your request in the "Contact" section of this site or call 209-688-5728.